Right up front in the introduction to her book, Adler explains that she modeled An Everlasting Meal: Cooking with Economy and Grace after MFK Fisher’s How to Cook a Wolf. She describes her inspiration as “a book about cooking defiantly, amid the mess of war and the pains of bare pantries.” There’s no war around here, but there is a mess outside. The pantry may not be bare, at least not in my kitchen, but there’s nothing like a hurricane to make you think about what might happen if you have to subsist on whatever you have on hand with little hope of rapid replenishment. Reading Luisa contemplate the “Depression Stew” she made in her barely-wingspan Parisian kitchen felt familiar to me. Luisa had learned to make Depression Stew from her father who liked to think of it as “the kind of food you’d eat during a financial depression, cheap and filling and healthy.” When she made it that year in Paris, she felt that the stew could also serve as “a remedy for more personal lows.” Even though I preferred to eat out with a book that summer rather than cooking anything in the similarly tiny kitchen of my one-room rented Left Bank apartment, I knew what she was talking about. 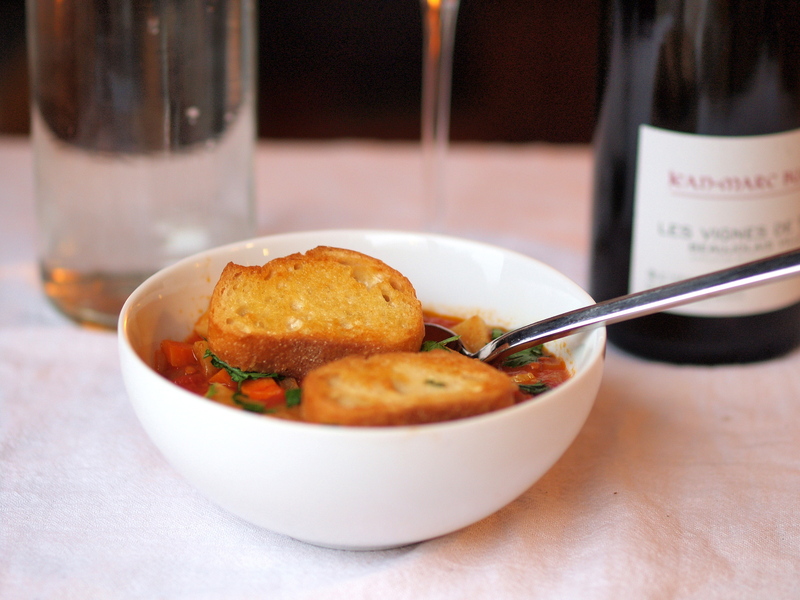 When I first bookmarked Luisa’s stew, I thought I’d make it when I was feeling a bit blue and I’d write about being lost in Paris. But after reading Adler’s Chapter 17 last night and watching reports of the strengthening storm and its havoc this morning, it seemed more fitting to write about the stew’s humble beginnings. I imagine Adler would approve heartily of Depression Stew. She recommends that you “get out a pot and a pan, and decide that no matter how hard the wind is whipping at the windows, you will be well fed through the storm.” She talks a lot about canned tomatoes and canned beans. The latter she says need a good long simmer in olive oil to “become really likable.” Even better if you cook them up with onion and garlic. And that’s where Luisa’s stew begins. And then Luisa fills out the aromatics with whatever is in the fridge – carrot, potato, zucchini – and a can of tomatoes. Luckily I had everything I needed for Depression Stew. 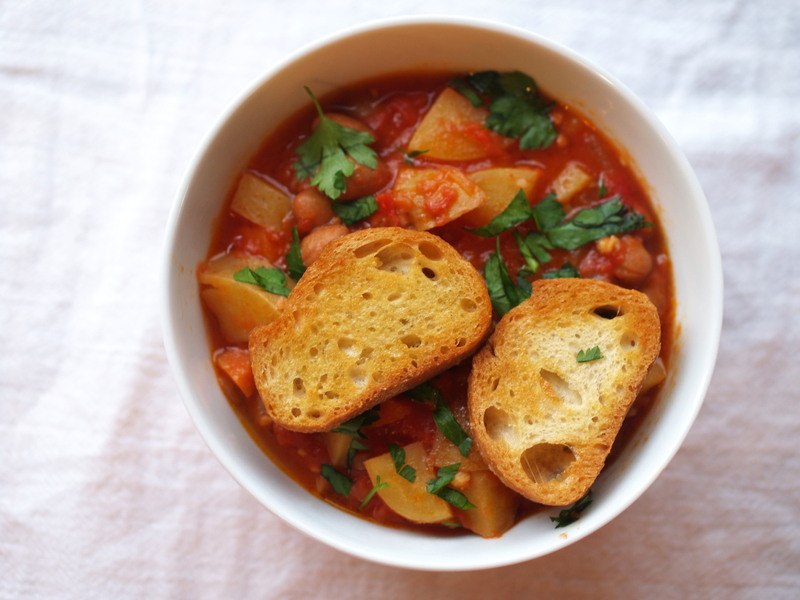 A couple of carrots that were a bit droopy, a handful of potatoes a bit soft, half a baguette a bit stale — food that might otherwise be headed for the garbage had this stew not saved them. I’m weathering hurricane Sandy just fine so far. Thanks, ladies, for keeping me company. I’m very lucky. This is one of those clean-out-the-fridge-and-pantry recipes. Use whatever vegetables you have on hand, just make sure to add the harder ones (e.g., carrots, parsnips) early and the more delicate ones (e.g., potatoes, zucchini) later. If you have a bit of stale (or fresh) baguette on hand, cut it into thin slices and make garlic toasts to float on top of the stew. If you have lemon and parsley lying around, a quick squeeze and a sprinkle really brightens up the dish. Heat. Heat the olive oil in a saucepan over medium heat. Dice. While the oil is heating, dice the onion and mince three cloves of garlic. Cook. Add the onion and garlic and cook, stirring every once in a while, for about five minutes until the onion is soft and translucent. If the onion starts to brown, turn down the heat. Dice again and keep cooking. While the onion is cooking, dice the carrots and potatoes. Add them to the pan and keep cooking for another five minutes or so. Continue to stir every once in a while. Squish and keep cooking. This is the really fun part. Pour the tomatoes in a large bowl and squish the tomatoes between your fingers, squeezing to break them up into small pieces. If there are any cores that feel rough, throw them out. Add the tomatoes, salt to taste, and a shake or two of red pepper flakes to the pot. Continue to cook for another five minutes. And continue to stir periodically. Drain and keep cooking. Drain the beans and rinse in cold water several times. Add them to the pot, stir gently, and bring the whole thing to a simmer. Turn the heat to low and keep the stew at a slow simmer for about 30 minutes. Cover the pot and add extra water if the stew gets too thick. Toast. Slice the stale baguette – you’ll want two pieces per person. Cut the last garlic clove in half and rub the cut edge on the baguette slices. Then drizzle or brush each slice with olive oil. Pop the baguette slices on a piece of aluminum foil and into a toaster (or regular) oven set to 350ºF. Toast for a few minutes on each side until the baguette starts to brown. Serve. Squeeze lemon juice over the stew right before serving. Spoon into a bowl, sprinkle with minced parsley, and float a couple of pieces of toast on top. This is SO much like my White Bean and Kale soup, without the kale. Can honestly say, this is a delicious soup (becomes a stew with less liquid). I would suggest adding crushed red pepper, but that’s just how I roll. This is such a well written post Gayle. So happy to pop over and I completely relate about the lingering over the books. Just saw you post your pic of cauli and tahini on twitter from Jerusalem. It looks delicious!